I like making a lot of sours based cocktails, but don't do so often enough to keep fresh juice on hand/don't like powdered sour mix. I extracted the zest of ~3lbs each of lemons and limes in half a bottle of 190 proof everclear, and then squeezed the juice and froze it. 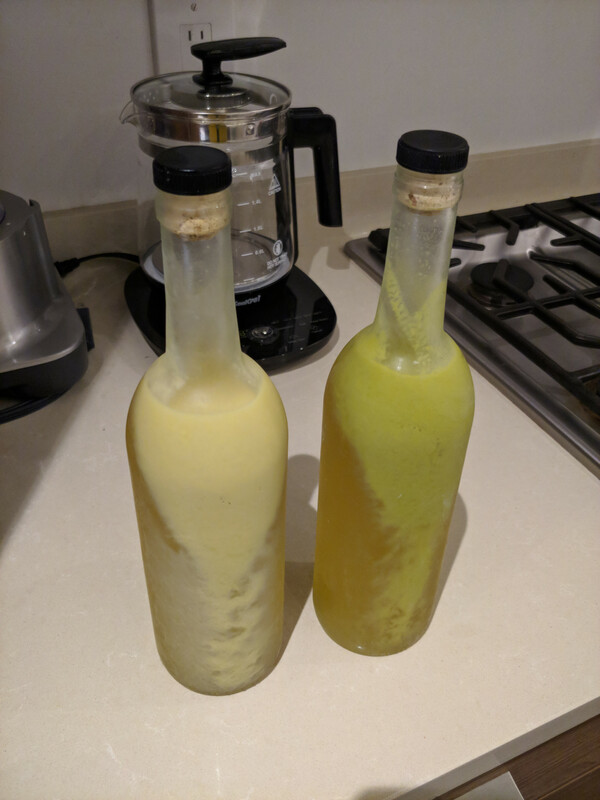 I let the zest extract for a week, and freeze distilled the juice down to ~200ml each for the lemons and lime. I mixed simple syrup (~200 ml), distilled juice (~200ml) and extracted zest/everclear (~350ml). This formed a weird colloid (picture attached). The good news is that you can find an answer here, the bad news it is not in English. Briefly, it doesn't say how to remove opacity now that you have it, but it gives explanation on not having it in your next try (basically, opacity depends on microemulsions in 190 proof everclear: if you use everclear mixed with water and sugar, and it is lightly heated, opacity will not appear). Not the answer you're looking for? Browse other questions tagged liquor liqueur or ask your own question.